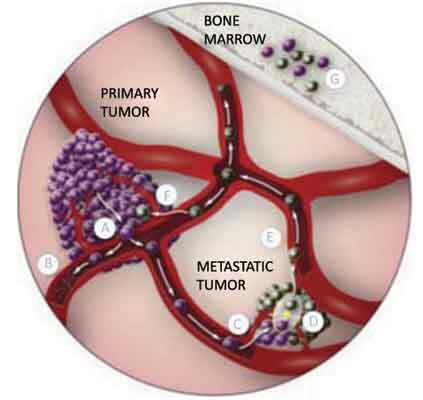 Metastasis is the cause of most cancer mortality. Circulating tumour cells (CTC) are cells that are released from a primary tumour into the bloodstream and that are considered to act as the main promoters of metastasis. These cells are therefore targets for the understanding of tumour biology and an improvement of clinical management of the disease. Early detection of CTC and analysis of their cell surface markers provide critical information for the diagnosis of cancer and its target therapy. CTC are shed into the bloodstream as tumours grow, and are believed to initiate the spread of cancer. The identification and analysis of CTC is thus an important objective for the development of noninvasive cancer diagnosis. Methods of capture and detection of CTC have been complicated and costly, and the captured cells could not be cultured and expanded directly. Because CTC are rare, existing as only a few per one billion blood cells, a highly efficient method is required to capture and to culture CTC for further assay. Chipbased and traditional methods have emerged to isolate, to detect and to characterize CTC. As CTC are a rare event, their investigation requires multidisciplinary considerations of both biological and physical properties. Chip-based biosensor platforms are being introduced into the technology for the quantification of CTC with promising results. This review describes recent progress in the identification of CTC; the approach developed has a simple workflow and scalable multiplexing, which makes it ideal for further investigation of CTC biomarkers. Biomarkers, Cancer, Chip-based biosensor, Circulating tumour cells (CTC), Metastasis, Non-invasive. Institute of Nanoengineering and Microsystems, National Tsing Hua University, Hsinchu, Taiwan.